I recently took a trip to Philadelphia. It was a bit of a leap of faith because much of what I know about the city does not really merit taking a trip to see, or see again as the case may be. Yes, I know, it’s the birthplace of America and then later … Sylvester Stallone made a movie which caught the world’s attention, and then he made five more. And sometime in between someone chopped up a steak, covered it with Cheese Whiz and onions, put it in a bun and called it a Philly Cheese Steak. All great stuff, but surely there’s more to Philadelphia than these old stereotypes. 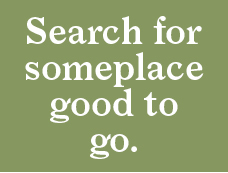 At Bearleader, like a bear to honey, we specialize in sniffing out a destination’s hidden delights and revealing them to our readers. So, confident that Philadelphia had secrets to be revealed, we hit the road to discover its little-known treasures. Here is a great thing we found that you have to visit Philadelphia to see. Did you know that aside from being the “city of brotherly love”, Philadelphia is also known as the “world’s largest outdoor art gallery”? It all started back in 1984 when the then Mayor, Wilson Goode, was trying to find a way to combat graffiti, which was blanketing the city. He proposed an anti-graffiti program as a way to channel the energy of young offenders into more productive endeavors. Mayor Goode enlisted the help of Tim Spencer and artist Jane Golden to create what came to be known as the Murals Art Program, with a modest goal of enticing kids to participate in organized art projects, and away from producing illegal “graffiti”. Giving young graffiti offenders the option of applying their talents to a designated area with the input of the community as opposed to going to jail was an easy choice for the early participants. 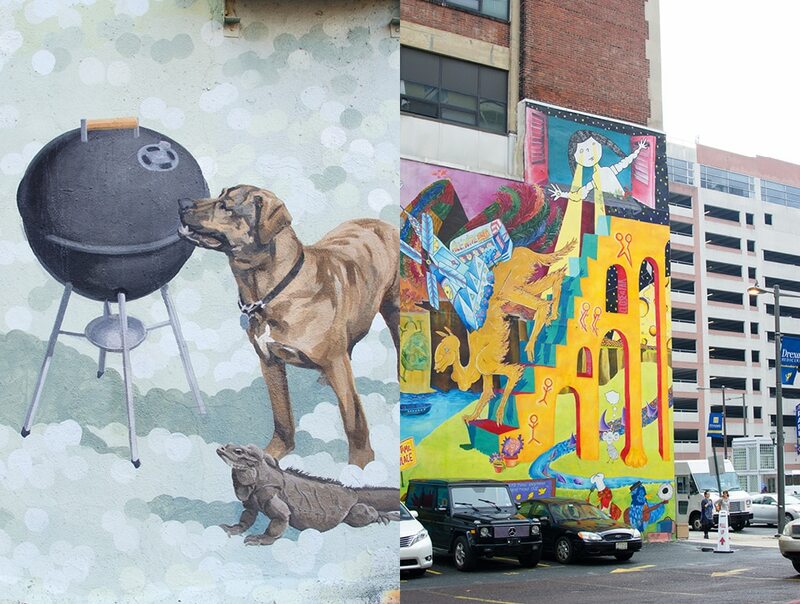 Many years later, the Mural Arts Program has exceeded everyone’s expectations. 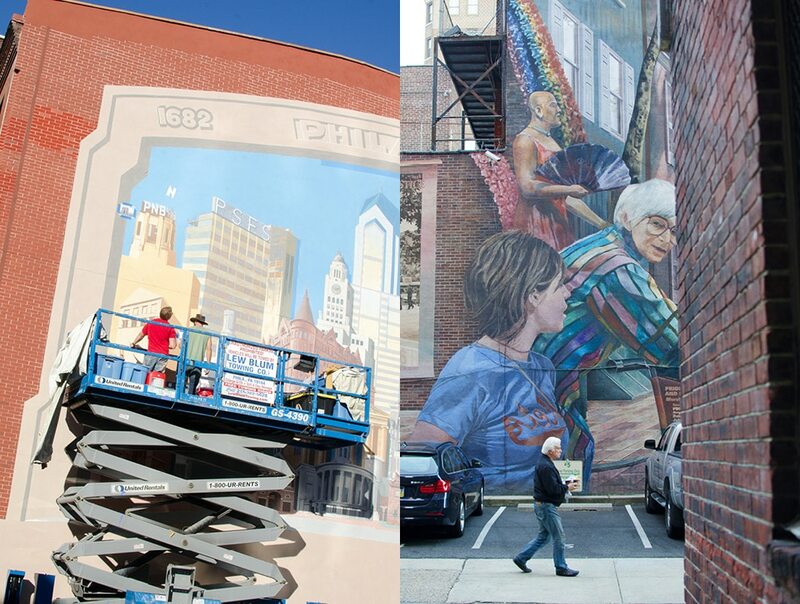 Still under the guidance of Jane Golden, the Mural Arts Program is now the largest employer of artists in the country, with around 300 individuals working on projects throughout the year. 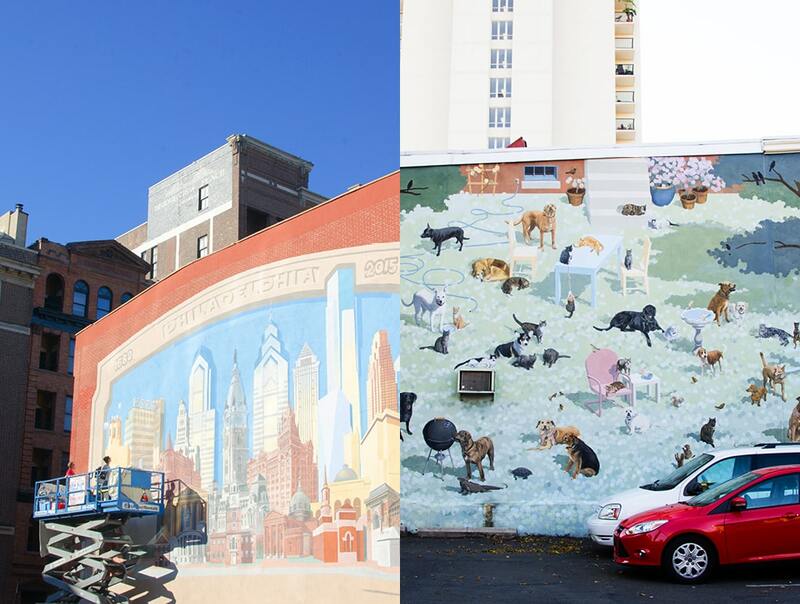 Since 1984, about 3,600 murals have been painted and about 2,000 can be found today in and around Philadelphia, with new ones going up all the time. On our tour we swung by to see one being painted, a large mural on a bare, south-facing wall in the Old City district, and had a chat with the trio of painters. Taking advantage of one of the last warm autumn days before the season’s end, artist and lead painter Jon Laidackaer was high above the ground marking out a tiny section of the enormous wall he and his fellow artists were slowly working their way across. Originally from Pittsburgh, Jon moved to Philadelphia ten years ago to participate in the Mural Arts Program. He was also the lead artist on the largest mural produced to date, 85,000 square feet in size and covering a parking garage close to the Philadelphia airport – just for reference, a football field is 57,600 square feet – that’s big! 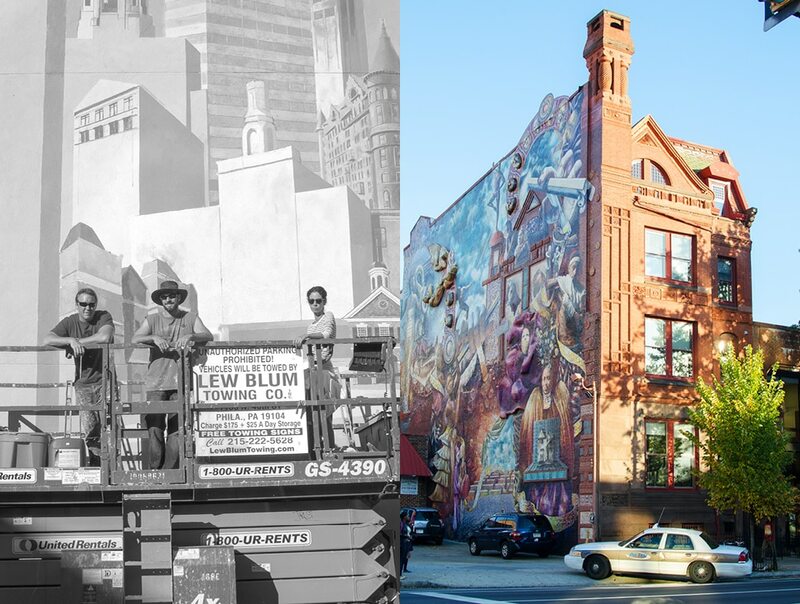 In many communities the Mural Arts Program murals are treasured and beloved by their residents. This is in large part due to Jane’s early emphasis on engaging with communities to solicit participation in determining the content and, in many cases, actually painting the murals. Community buy-in on projects means that they can easily move forward, having heard and accommodated dissenting voices early in the process. 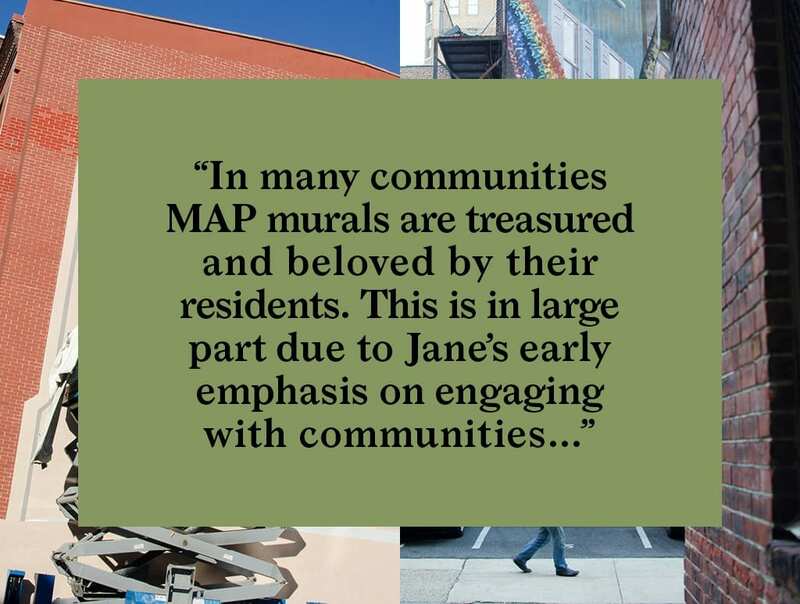 With a structure of community communication built into the Mural Arts Program’s working process, a side benefit quickly became apparent to Jane’s team. They were on the city’s front lines as de facto government representatives. 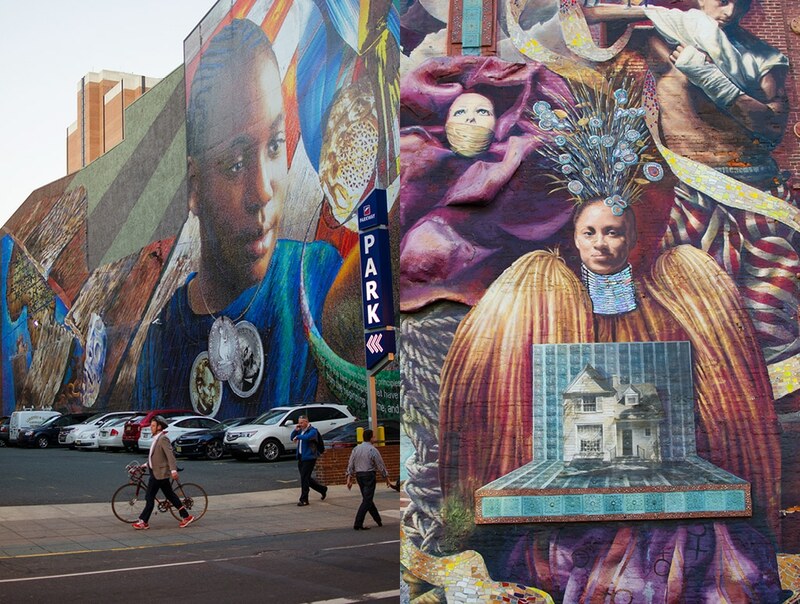 So when meeting with communities to offer funding for a neighborhood mural, they often would hear about other local issues of concern to the residents. In fact, even within communities there was sometimes little communication, so bringing people together to discuss a mural also became a forum in which to discuss other issues of local concern. In this way the the Mural Arts Program became both a facilitator of change, and a conduit for communication with city government. 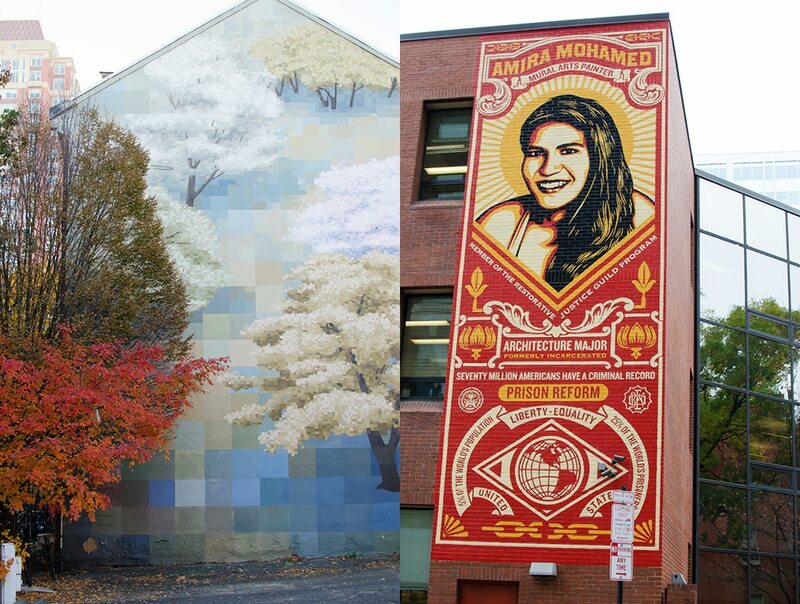 With its great success, the Mural Arts Program’s repertoire of production techniques has developed rapidly to accommodate a more inclusive community-based process. Early murals from the ‘80s were produced with conventional acrylic-based paints on surfaces sometimes not conducive to long-term exposure to the elements. 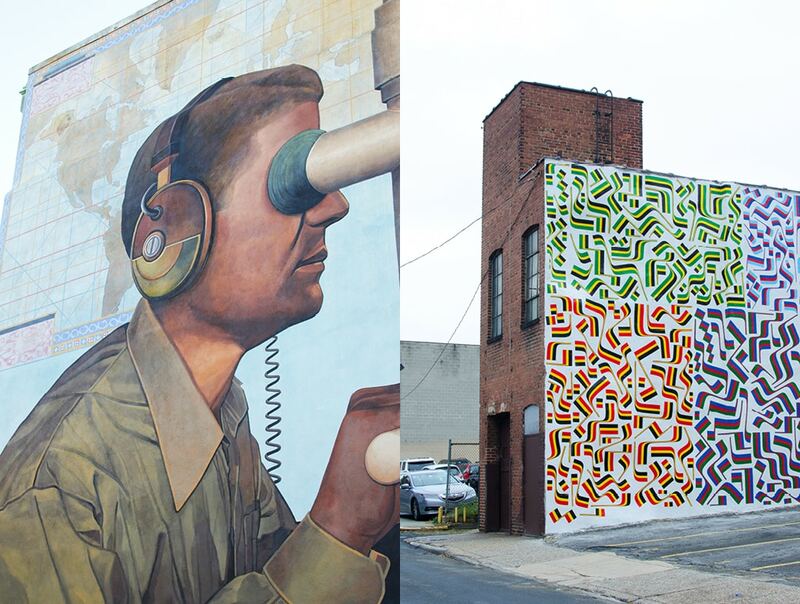 Learning from the past, new murals are produced with much more durability via a variety or innovative techniques. First there is the old-school method of painting directly on a wall, but not with pealing and fade-prone acrylic paint. In its place, a permanent masonry-based paint imported from a Germany is the new standard. This is what Jon and his team were using. Jon says that even the sun-drenched south-facing wall they are currently working on could easily last 30 years without much noticeable fading or damage. Another technique utilizes a substrate of durable parachute cloth so murals can be produced off site on a horizontal surface and later installed at the designated location. This is great because, as you might imagine, having volunteer artists working high up on scaffolds may not be the best idea. Painting on the ground, everyone can get involved and it can happen year round – another important benefit. The parachute-cloth technique led to other possibilities. 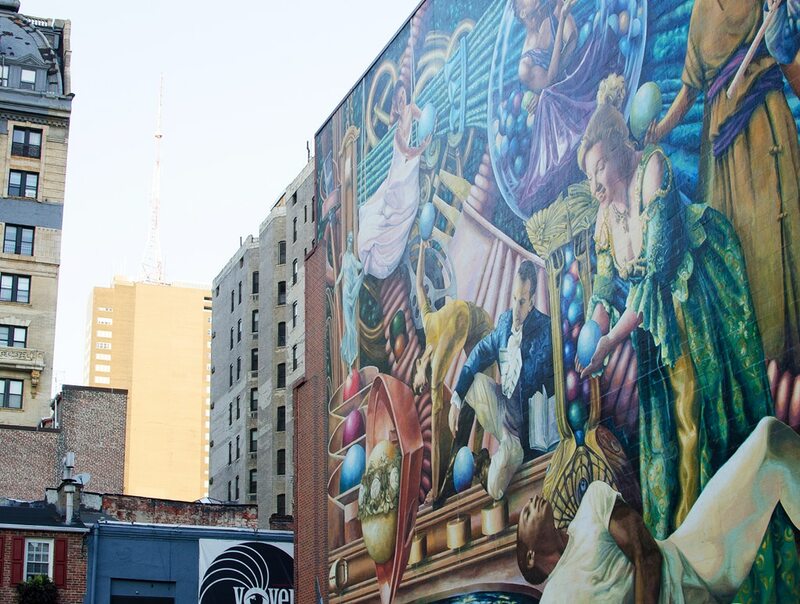 One, the Mural Arts Program program goes into prisons and engages inmates in mural projects. When the murals are later installed around the city they form a point of contact between the incarcerated and their families: a tangible memento of a loved one, inaccessible by any other means. Which brings me to one of the Mural Arts Program’s most recent projects. The location chosen for this artwork is the Friends Center, headquarters of the Quaker Society in Philadelphia. The Quaker Society has a particular interest in prison reform. Famed artist Shepard Fairey, of Obama-poster fame, was commissioned to do the work. To contextualize his work in the vein of the Quakers’ ethos, Shepard produced a work called “The stamp of incarceration” showing a young woman, Amira Mohamed, who, after being incarcerated for seven years, is now part of a rehabilitation program, and studying to become an architect. Formally incarcerated individuals often have limited visibility within society so Shepard’s artwork places Amira in the context of a stamp, a representation reserved for those of high achievement in our society. Celebrating individuals like Amira in this format gives voice to their great achievement in turning their lives around, adding weight to the Quakers’ emphasis on restorative justice. I sometimes think about the 1929 WPA Federal Art Project, which hired hundreds of artists and resulted in over 120,000 paintings, murals and sculptures over its 14 year span. Some of the 20th century’s greatest artists came out of the program and the public benefited greatly from their creative vision. Why, I wonder, couldn’t something like this be done today? 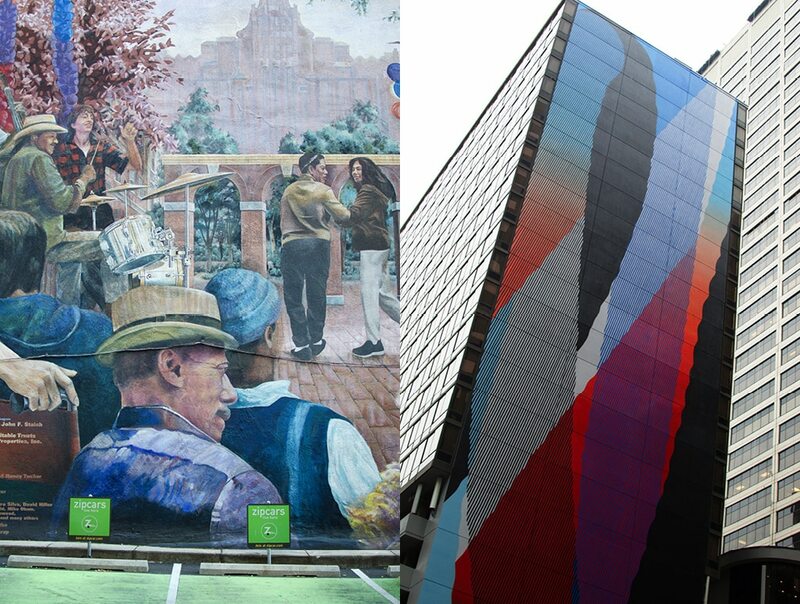 Well, in Philadelphia the Murals Art Program is, and to tremendous positive effect. In Jane Golden’s words “Art ignites change”. Planning a trip to Philadelphia? Here is the current weather and what to expect for the next few days.